In 2016, we will celebrate the 23rd annual Carmel Art Festival, a public benefit event held to educate and inspire people of all ages about the visual arts. All events will be held on Mission Street between Ocean Avenue and 6th. On Friday evening, artists will bring their freshly painted entries to Mission Street for first viewing. On Saturday, the Plein Air competition starts out with judging the 120 entries, followed by the silent auction until 6:00PM. Purchase posters from this and past years events. Listen to live music. On Sunday morning at 9:00 AM, a 2-hour Quick Draw by the winning artists will be held. Mostly, artists can be seen painting around Carmel-by-the-Sea and Carmel Beach. This is followed by a half-hour silent auction between 11:00AM to 12 NOON. On Sunday, from 8:00AM to 3:00PM, an additional 100+ paintings will be up for sale, those that the 60 artists painted during festival week, but were not part of the competition. These are being sold at a set price. Many galleries in Carmel-by-the-Sea schedule their own shows, receptions, painting and sculpture demonstrations to coincide with the Carmel Art Festival. These are publicized in our festival booklet handed out FREE during the event (if provided by the galleries with festival organizers before the printing deadline). Note: Posters from the current and past years are also for sale throughout the year. See link on the navigation bar. Just email us your request. 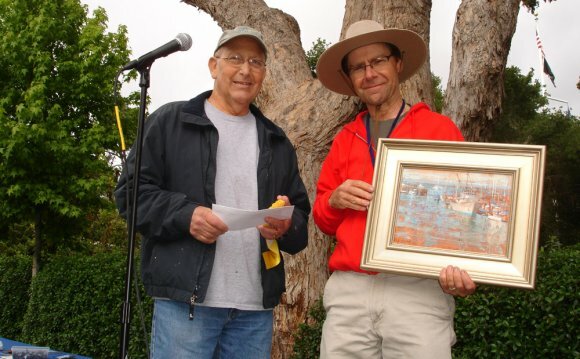 The Carmel Art Festival in Carmel-by-the-Sea, California, 93921 is a non-profit organization with donations from these events supporting local youth art programs. The Carmel Art Festival is always the weekend after Mother's Day weekend. The event is always the weekend after Mother's Day. Application and artists information is always published here by September 1. Deadline to enter is December 1. It is a juried event. Only 60 artists are chosen each year. List of juried artists are posted on this website by March 1 before the festival. It is the responsibility of the artist to check this website for updates. If you want to get on our email list, please sign up by clicking icon below. and we will send a FREE email blast to our list! We will also include your event in our PROGRAM. Send this information to us in APRIL, 2016 in time to be included.